And it is almost lutefisk season. Some of you are probably not familiar with this delicacy. It is cod fish treated with lye, dried, shipped to America from Norway, where it is then soaked in water. When reconstituted, it becomes a rather slimy, smelly, holiday treat. It is served boiled, steamed, or baked. It is best topped with melted butter, which is the traditional way to serve it. You can serve it under a cream sauce if you are short of butter. I like it with a little salt and a lot of pepper, but that is probably an American addition. In our area it is in the grocery store from Thanksgiving through the New Year, and then again in May. Although I have never been to Norway, I understand that her citizens no longer actually eat lutefisk. Nor do they eat much lefse or flatbread. That was poor man's food and when the poor folks left for America, the Norwegians became more affluent. The Norse people progressed with electricity and refrigeration. But here in America we cling to our poor family traditions. The very mention of lutefisk causes many people to wrinkle their noses. It is quite aromatic, especially during cooking. But as my mother does, as my grandmothers did, and as my great-grandmothers did, I cook lutefisk once in a while. We serve it every Christmas Eve. Our menu has remained virtually unchanged for over 100 years. The reason makes an interesting story. Lutefisk reminds me of what my Great-grandmother, Kirsti Engen, did for me. Of my great grandparents, she was the only one still alive when I was born. She, perhaps, gets more credit than she deserves if all were equal, but then, long life has its own rewards. Her husband left her in Norway with two small children when he emmigrated to America. The families there were in dire need and starvation seemed a certainty for many during those times. However, there was one exciting possibility. The New World of America still had land and opportunities for all. A couple of years later he sent the money for her tickets. She packed up a wooden trunk of possessions and a small wooden box of food for her children. She feared that the fare on the boat would upset their tummies. The trip was especially dangerous for toddlers and her plan was to keep their food as close to normal as possible. She went alone with her children to meet her husband in Dakota. She traveled first by boat and then by train. There was no extra money for her husband, Einar, to travel to meet her when the boat anchored. They got off the train in St. Paul, not quite knowing what to expect. He was waiting. 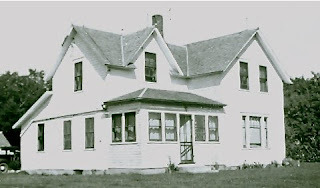 Less than a year after her arrival, my grandmother was born in their sod house. Soon, a wooden frame house was built. They worked dawn to dark every day in order to stay alive. Four months before her youngest child was born, her husband died. She named the boy Einar and proceeded with their plan. She managed to keep her family on that farm by working hard as a farmer and a midwife collecting whatever fee the family could spare. Her one luxury seems to have been trips to the photographer with her children. I have often wondered if those photographs were paid for with money sent by her family in Norway, but I will never know. I remember celebrating her 100th birthday in the old frame farm house. This photo was taken in the 1940's after years of relative prosperity in America and many additions. The inside remained humble, with no carpeting, very basic furnishings, and no indoor plumbing. There was a dip in the yard where the sod house had stood. All seven of her children celebrated with her on that day. We buried her the next year on my eleventh birthday. Because I was her namesake, it seemed a fitting end. I keep her wedding ring, a simple, well worn, gold band in my jewelry box. I received it as a gift from her spinster daughter Ada. She is wearing the white necklace on the photo. 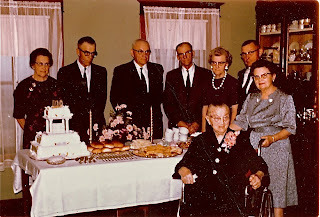 My grandmother is on the left behind the cake. Great Grandma ate lutefisk, lefse, flatbread, and many other simple foods. They reminded her of the home in Norway that she left and never saw again. She came here hoping for a better life and lived that life with loyalty, courage, and faith. The aroma and ritual of preparing these recipes made her feel closer to home, especially on Christmas Eve, when all Norwegians are celebrating. I don't know if her life was better for the sacrifices she made, but I know mine is. I am inspired by the loyalty she showed her husband. 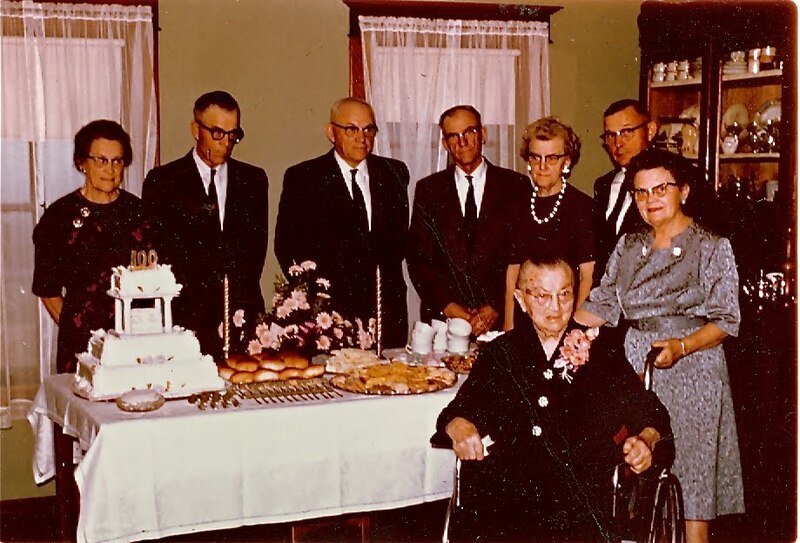 I am amazed by the courage she mustered raising seven children alone on the prairie in a country so strange that she barely spoke the language. I admire her constant, unwavering faith. In our family we were taught to thank God we are Americans. We keep our Norwegian traditions not because of where they come from, but because of those who taught us to enjoy them. These poor traditions bring the generations closer, and I cherish them each Christmas Eve. What part of Norway was your great grandmother from? You and Farmer Fred should visit. My husband and I had an amazing time exploring the fjords of Norway. Great Grandma was married in a church in Selbu, Norway. I assume she was from the surrounding area. Thanks, Andy. The Rural Women Rock connection with the girls will be fun!